(Bloomberg, Davide Scigliuzzo, 31.Oct.2018) — Venezuela just forked over almost $1 billion to stay current on a bond backed by shares of its U.S. refiner Citgo. 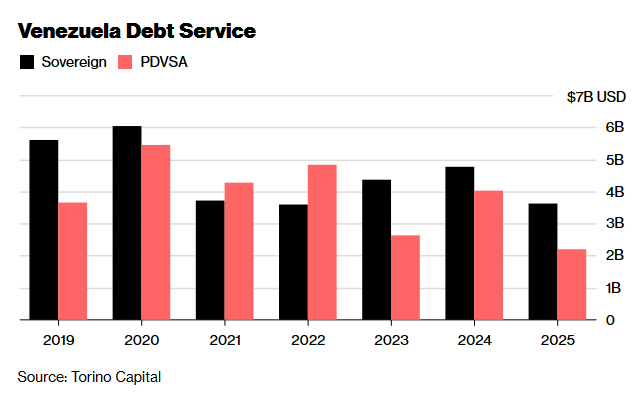 Yes, the payment ensures that Venezuela’s state-run oil company PDVSA gets to hold onto Citgo Holding Inc. for now, but many analysts think it’s just a matter of time before it has to forfeit the company. “It is hard to visualize a scenario in which Venezuela does not sooner or later lose Citgo to one of its defaulted creditors,” Francisco Rodriguez, chief economist at brokerage Torino Capital, wrote in a note on Monday. With the country starved for cash and already in default on many of its foreign bonds, the line of creditors that could lay their hands on Citgo is very, very long: Russia (from collateral for loans from state-run Rosneft); Canadian miner Crystallex International Corp. and U.S. oil giant ConocoPhillips (both of which won international arbitration cases against Venezuela); Citgo’s own bondholders (from collateral on debt); and the PDVSA bondholders who were paid Monday. — Citgo’s strategic value for the Venezuelan government is so great that the payment may be worth it even if the company will be lost to creditors in coming months. Citgo is a reliable buyer of PDVSA crude abroad and also provides the company with additives that make Venezuela’s heavy crude easier to export. — Venezuela is appealing a U.S. ruling that awarded Crystallex the right to collect on an arbitration award by taking shares of PDV Holding, the Delaware corporation through which PDVSA controls Citgo. By staying current on the collateralized PDVSA bonds, Venezuela can buy time as it awaits a verdict. Attempts by PDVSA to stop a sale of Citgo have so far failed. A key hearing is scheduled for Dec. 20. — A default on the collateralized PDVSA bonds could complicate Venezuela’s relations with Russia. If holders of the bonds foreclose on the 50.1 stake in Citgo that represents their collateral and force a sale of the company, Rosneft, that has a claim to the remaining 49.9 percent, could be sidelined in that process. — Citgo may have achieved symbolic value for President Nicolas Maduro even if the socialist regime has considered getting rid of the unit in the past. Losing Venezuela’s most valuable asset abroad could be seen as a defeat for a government that is already deeply unpopular at home and has made of standing up to hostile foreign powers a key part of its rhetoric. — For now the 2020 bond is trading over 91 cents on the dollar with investors eyeing the next payment in April.